Capture leads for Salesforce offline. Use QuickTapSurvey to collect data anywhere and seamlessly add new leads to your Salesforce org. Integrate your surveys with Salesforce to update your org with new leads and contacts. Setup is quick and easy! At a conference or out in the field? Simply pull up surveys on your iOS or Android device to capture data anywhere. Don't let bad WiFi ruin your campaign. Collect info for Salesforce offline and sync it with your org when you reconnect. Collect lead data in multiple formats, including email capture, GPS location, photo capture, rating scales, and more. Create beautifully branded surveys without needing to know how to code. Add your brand colors, logo, and more. Nurture your leads with customized email follow-ups that can be sent automatically as soon as a survey is submitted. Don't waste time on dead ends. Assign different scores to responses automatically to identify quality leads quickly. Turn your Salesforce lead capture surveys into sweepstakes or giveaways with scratch card and instant draw tools. Transform your tablet into an interactive kiosk to collect leads at events. Instant alerts will keep you updated on uptime. Take your lead capture to the next level. The team at Alcatel-Lucent Enterprise used QuickTapSurvey to reduce their lead collection process from 3 weeks to only a few days. Run seamless lead capture campaigns at your next event. No scanners needed! Set up a kiosk at your checkout counter or front desk to capture customer data. Attract more visitors to your booth by running a contest or sweepstakes campaign. Create surveys from scratch to capture data for Salesforce offline, or get started with one of our customizable templates. Enhance your Salesforce lead capture. 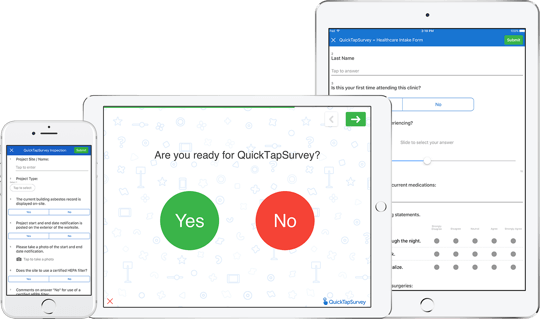 See QuickTapSurvey's lead collection capabilities in action by starting a free trial. No credit card needed.